There's lots of action in the resort's pirate ship pool. The Key West vibe rings in the air at this rental resort. Kids of all ages will marvel at the water giant bucket. Putt between the palms and ponds of Key Lime Green. Pull up a seat on the lakeside patio and take it slow. Tons of arcade games await the kiddos. There's a pirate ship pool, huge water slides, fun water features, and a mini golf course. Head next door to the Ritz Carlton for a relaxing spa and golf day. Enjoy a casual meal and drink by the pool at the Patio Bar and Grill. Marriott’s Harbour Lake is a Key West-Style Lakeside Resort that pulls it off with Disney-like perfection. Pristine cobblestone streets and warm island architecture feel like the Main Street of an island paradise, only in the heart of Orlando. After dropping off your luggage in your condo, get changed into swimsuits, grab dive sticks and foam noodles, apply sunscreen and get ready to be amazed by the two outdoor pools. One has a pirate ship and the other with a waterslide. Little ones will have a blast at the interactive water playground while grownups will appreciate the poolside bar. When it’s lunchtime, the on-site bar & grill has you covered. There is no shortage of activities available at the resort. Athletes will love basketball, sand volleyball, soccer and even mini golf. If you’re looking for a more traditional workout, the resort has a well-equipped fitness center. While you are getting your cardio on, let the children hang out in the game room or participate in the scheduled activities. Before heading back to your condo, stop by the playground so that the kids can run off their energy just in time for their afternoon nap. With all of these amenities, it’s no wonder that Marriott’s Harbour Lake was awarded a TripAdvisor Certificate of Excellence. One- to two-bedroom condos sleep four to eight guests. Fully equipped kitchens allow you to save money by making your own meals. Bring the kids along to Publix to stock up on groceries and make sure that no one’s favorites are forgotten. Make your famous lasagna for dinner and let the kids assist – someone has to make sure there’s enough cheese. While the lasagna is baking, take advantage of your flatscreen TV with CNN, ESPN, HBO and a DVD player. Bring favorite movies from home or browse the selection of rentals available at the resort. If you really want to show off your multi-tasking skills, throw a load of laundry in your in-suite washer/dryer while the movie is playing (and the lasagna is baking). Don’t worry if the movie isn’t finished in time for dinner, on vacation you can eat and watch TV at the same time. Marriott’s Harbour Lake is just a short drive to SeaWorld®. Go for a ride on Mako; it’s the tallest, fastest and longest rollercoaster in Orlando. Experience the South Pole through the eyes of a penguin on Antarctica: Empire of the Penguin. It’s a motion-based simulator ride that has two versions: “mild” is great for kids or those who are prone to motion sickness. Brave big kids and grownups will enjoy the “wild” version. Animal Experiences at SeaWorld® include dolphins and five different species of penguins. Movie lovers will want to visit Universal Orlando®. 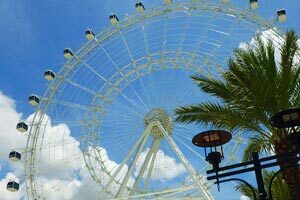 It’s made up of two theme parks: Universal Studios® and Universal’s Islands of Adventure®. Universal Studios® has rides that feature characters from E.T., Shrek®, Despicable Me® and Men in Black®. The Wizarding World of Harry Potter® - Diagon Alley has Ollivanders Wand Shop, Flight of the Hippogriff and The Tales of Beedle the Bard trunk show. Board the Hogwarts Express (with a park-to-park ticket) and head over to Universal’s Islands of Adventure® and Hogsmeade. Check out the Triwizard Spirit Rally, get Quidditch gear at Dervish and Banges and see a performance from the Frog Choir. Islands of Adventure is also home to rides that feature characters from Jurassic Park, King Kong, Spider-Man and the Incredible Hulk. Kids (and kids-at-heart) will love Walt Disney World’s Magic Kingdom, where you will find Disney’s most classic and well-loved attractions It’s a Small World®, Peter Pan’s Flight®, Dumbo the Flying Elephant® and Haunted Mansion®. Dine at Be Our Guest Restaurant®, ride the Walt Disney World® Railroad and visit Walt Disney’s® Enchanted Tiki Room. Reservations are required for massage services. Reservations can be made by contacting the condominium resort prior to arrival, using the contact information on the booking confirmation.